(CNN) - Independent Sen. Bernie Sanders of Vermont criticized Texas Rep. Ron Paul on Monday for blasting the Federal Emergency Management Agency as a useless entity. 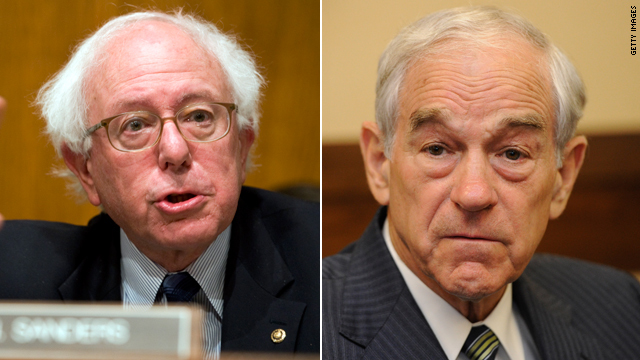 "I like Ron Paul, but on these issues, he's completely out to lunch," Sanders told CNN's Wolf Blitzer, anchor of "The Situation Room." The Republican presidential candidate made headlines when he said on the campaign trail Friday that Americans are capable of recovering from natural disasters without the help of FEMA. "All they do is come in and tell you what to do and can't do," Paul said. "You can't get in your houses. And they hinder the local people, and they hinder volunteers from going in." But Sanders, whose state is experiencing mass flooding and power outages in the aftermath of Hurricane Irene, said FEMA is on the ground in Vermont. He argued now is the time for the country to come together. "We are a nation. We are not 50 individual states," Sanders said. "Vermont stands with other states when they're in trouble, and other states stand with us. That's what being a nation is about." That old loon Paul has been out to breakfast, lunch, brunch, dinner, and support for a long time now. Much of what Ron Paul said was very accurate – he highlighted the mistakes in New Orleans with all those unused trailers and sending checks to wrong people etc. That is hardly out to lunch. If stilt home in flood prone areas can get coverage against storms it is nuts if it is the government who helps. encourages dumb behavior and that was his point IMO. Ron Paul is on the right tract. FEMA is not needeed. It is a bloated organization that just gets in the way. Bernie Sanders uses his rhetoric again! Baseless and useless. Right.. Ron Paul is wrong.. lmao people argue of the "idea" of helping Americans which I think we all do. We volunteer or send resources or money over to disaster areas but Ron Paul argues in a deep understanding of the internal workings of FEMA and exposes how they are a fraud to Americans. Ron Paul is not saying leave these people to die he is exposing the failure of centralized planning and in the real world how much more efficient it is to leave it to the states and have no restrictions on Volunteers or resources coming in that would ultimately go to the people not through the federal government which ruins everything it touches and has no accountability but justs keeps asking for more and more money that we don't have. There are other options don't be sold on FEMA is what it comes down to they are a fraud and Ron Paul is the only candidate with the integrity to expose them. I don't see how you Dems are against Ron? Faux news hates him, the GOP hate him and the political establishment hates him. Doesn't that make you like him? No ofcourse not. You are on the Obama cheersquad and you have to cheer like sheep for your "team". In a head to head match up it's almost a statisical tie with Paul vs. Obama. That scares the establishment to death. So queue up the wingnut, and baseless crazy talk against Ron when he is actually the smartest candidate running. You know you have no arguments against him so you resort to the lowest common denominator, name calling, what intelligent liberals you are. Name calling just like the people you hate over at Fuax News. Ron Paul 2010, sound monitary policy and foreign policy where we aren't the policeman of the world creating more terrorist. The socialist telling the libertarian he is out to lunch.....lol keep your marxism bernie, its worked so well for so long.......doctor paul 2012 or none of the anove! Maybe they both should have dinner and talk about it ! I read all the coments from Ron Paul supporters defending his anti FEMA comment by saying he want it to be run efficiently at the state level. 1) If State government is more efficient than Federal Government, isn`t Local government more efficient than the state? Why stop conveniently at the State – – because Paul said so? Because it fits a pre-existing narrative from the GOP about "states rights"? Carry your logic through to its natural conclusion. 2) On the other hand, isn`t it wasteful to have each state size its emergency response to address the natural disaster that may or may not occur in their locle? For example a FEDERAL team went to NC, VA, MD, NJ, etc. Nothing was wasted this year on FL or New Orleans. But if the STATES had to plan for disasters independently, each would provision to a higher, more wasteful, level. There`d be no application of excess capacity in another state; each would act parochially – selfishly. Sorry folks, I don`t see your "states are more efficient" argument supported. Items 1 & 2 above attack it from both sides. You have to be intellectual dishonest to tout the state solution. I agree with Ron Paul. FEMA is not needed. FEMA has too much power. Most people does not know what FEMA role is in government. Most thinks of FEMA as a team set up for natural disasters to come to our rescue when needed. The fact is, FEMA has a bigger role and people should know what they are. Google FEMA executive orders. Most would be shocked when they learn what powers they got over the general public and businesses. Here is an example: Executive Order #11000: Seizure of all American people for work forces under federal supervision including the splitting of families if the government finds it necessary. Ron Paul wants to be rid of FEMA because he believes it is inefficient and hinders recovery from natural disasters. In the interview where he said this he also said that the state and local governments should be the ones involved in providing relief to these disasters as they know more about the region and disaster than the national government. Paul also expects other states and volunteers to come to the aid of the victims. I'm not sure, however, how many people will actually volunteer and help out though. I would expect more of an outcry to get the feds involved but that's just my opinion. Wasn't Bernie stridently opposed to the Wall Street bailouts? That a socialist for you: they always start braying about unity when they think they can get their snouts in the trough. I have to agree, I am a conservative, but I think Paul is playing with a few cards short of a deck. I wish he would stop trying to throw the race back to BHO, I sometimes wonder just who's paying him to screw up the election! Ron Paul is a good man. However, he is out of touch with reality. He can not understand the role of FEMA. He believes that we do not need any government. There can be problems with any government. Horse Hockey! Everyone supports federal spending when they are on the receiving end. Bee Tee Dubs, I'm a Virginian. Right on the money. Paul is the six percent candidate in the primaries. out to lunch and out of his freakin mind. Sanders has it right. Ron Paul is a loon, talking about his state handled a hurricane in 1900! Well, a lot of people DIED then, but that doesn't matter to Ron Paul. All this talk of cutting FEMA and EPA is madness. Cut Congressional salaries if they're so intent on cutting something, we're getting more for our money with FEMA and EPA than these birds.